Published: July 8, 2016 at 01:41 p.m. The NFL might have gone dark for the weeks leading up to training camp, but that doesn't mean players' fantasy stock will stay put. We're scouring the news wires to find all of the info that will definitively help you set your draft strategy for later this summer. Or this could all change in a week. So, y'know ... whatever. 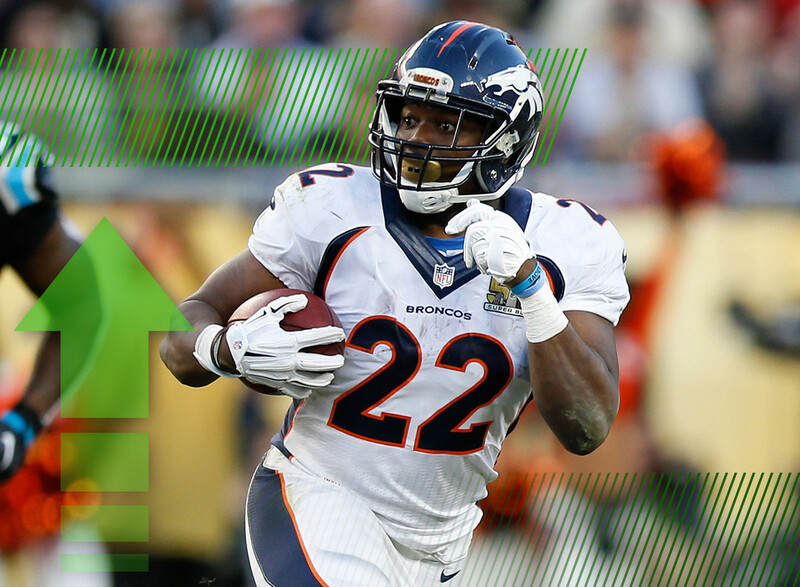 Anything associated with the Broncos running game has received a nearly weekly boost. Then again, that's what happens when your quarterback competition is between Mark Sanchez, Paxton Lynch and Trevor Siemian. Enter Anderson, who believes the Broncos are poised to run the ball more this season. While Anderson isn't in charge of the weekly gameplan, he is smart enough to look around at the roster and see how things are shaping up. Anderson continues to be one of my big bounce back candidates of 2016. It's understandable that there should be plenty of excitement around Benjamin's return. After all, Cam Newton's MVP season made a fantasy relevant option out of Ted Ginn last year. How much better could Benjamin be while building upon his big rookie year in 2014? Well, if the reports are to believed (which is always tough this time of year) then the Panthers could use a "committee" approach at receiver. It's hard to explain what that means, but the short version is that Benjamin could see fewer targets. That's undoubtedly bad. Full disclosure: I'm not totally sure what to make of this one. On one hand, Browns running back coach Kirby Wilson says Johnson can be Cleveland's "ultimate weapon". On the other hand, head coach Hue Jackson continues to talk up Isaiah Crowell. We're not likely to get any clarity on this backfield situation anytime soon. The offseason didn't start particularly well for ASJ after being kicked out of a Buccaneers practice for a poor attitude. There's concern that said attitude could negatively impact Seferian-Jenkins' ability to be on the field consistently during the season. What's that sound? Is that Cameron Brate's music?! Oh my gawwwwd!!! Following Prosise has been like summer itself -- more particularly, it's been like riding the roller coaster at your local theme park. Not long after the draft, hosannas were being sung in the Pacific Northwest about Prosise's ability. That was fun. Now come reports that the rookie missed most of the offseason program while dealing with a hip issue. That's not fun. One of the most consistent stories of this offseason has been the maturation of Amari Cooper and Derek Carr. The two started to make beautiful music near the end of last year. This season, it looks like they're ready to take their act on the road. There's no doubting Cooper's talent and if his development is truly on track, he could challenge to crack the top 10 this season. Much like Cleveland's running back situation, there is no clear answer at the quarterback spot. However, it's looking like more and more of an uphill climb for RGIII to win the job in training camp -- especially when reporters around the team are using words like "underwhelming" to describe his work in practice. Anyone believing Griffin had the makings of a late round deep sleeper might need to put those aspirations on hold for the time being. The Parker hype train has been steadily picking up steam as we get closer to the start of training camp. Talk that the young wideout will be 100 percent healthy for camp will only fuel the fire. This is the year that the Dolphins offense finally takes off, right? Not like all of those other years that it was going to blow up. This is really it. It's really happening. And Parker is going to reap the benefits. Get on board. Or not. But hey, at least he'll be healthy for the start of training camp. Things seem to be going Boyd's way. He's ticketed to be Cincinnati's slot receiver to begin the season and there's a thought that he could contribute right away. But that excitement is tempered when you learn that the Bengals could use more two-back sets while waiting for tight end Tyler Eifert to get healthy. That potentially means more targets for Giovani Bernard and fewer for Boyd. Alas, the rookie's day may still be on the horizon. Murray left us wanting more last season. If Raiders offensive coordinator Bill Musgrave is right, we could get our wish. With Oakland adding veteran lineman Kelechi Osemele, the coaching staff believes the run game could be more productive in 2016. That could mean rookie DeAndre Washington gets a little extra burn this season, but I'm holding out more hope that it means good things for the Raiders lead back.